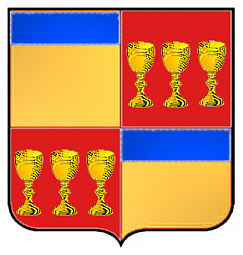 Coat of Arms: A shield divided quarterly: Six gold cups on a red shield and two sections of gold and blue. 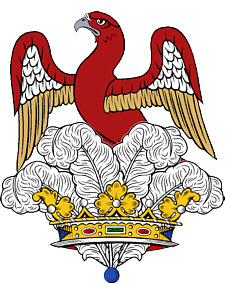 Crest: A plume of ostrich feathers emerging from a crown with a falcon rising. Spelling variations include: Butler, Buttler, McRichard and others. First found in Kilkenny in Ireland. 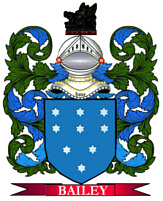 The first on record was Theobald FitzWalter, a distinguished Norman noble who accompanied Strongbow and was created the Chief Butler of Ireland in 1177. Some of the first settlers of this name or some of its variants were: Christopher Butler who settled in Virginia in 1670; the following, Charles, Daniel, Edward, Elizabeth, George, Giles, James, John, Joseph, Martin, Michael, Patrick, Richard, Thomas and William, all arrived in Philadelphia between 1840 and 1860. 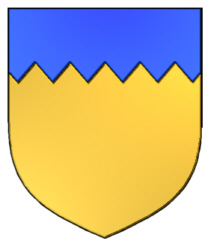 Coat of Arms: Gold shield with a blue chief dancetee. Spelling variations include: Butler, Buttlar, Büttner, Butlers, Butlern, Butlen, Butlinck, Buttler and many more. First found in Prussia, where the name emerged in medieval times as one of the notable families of the region. Some of the first settlers of this name or some of its variants were: settlers who travelled to the New World and established themselves along the eastern seaboard of the United States and Canada in the 18th and 19th centuries. English and Irish: from a word that originally denoted a wine steward, usually the chief servant of a medieval household, from Norman French butuiller (Old French bouteillier, Latin buticularius, from buticula ‘bottle’). In the large households of royalty and the most powerful nobility, the title came to denote an officer of high rank and responsibility, only nominally concerned with the supply of wine, if at all. Anglicized form of French Boutilier. Jewish (from Poland and Ukraine): occupational name for a bottle maker, from Yiddish butl ‘bottle’ + the agent suffix -er. French: occupational name for a wine steward or butler, usually the chief servant of a medieval household, from Old French bouteillier, ‘butler’. This name is often Americanized as Butler.